How to extract the login page URL from the home page response text? You can add a Regular Expression Extractor to the HTTP request to extract the login page URL from the home page HTTP response text. as shown in this tutorial. 1. 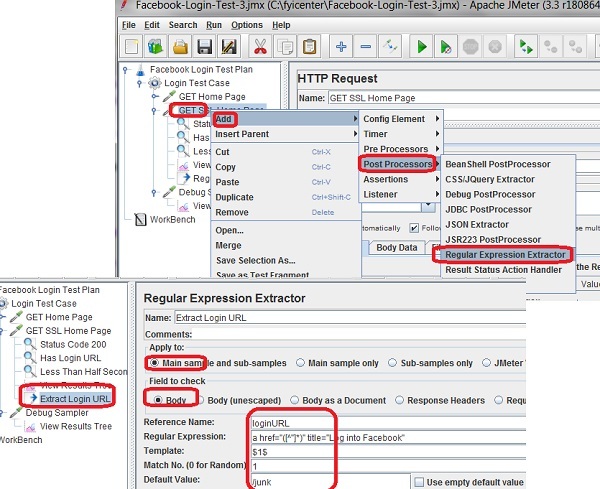 Start JMeter on your computer and open "\fyicenter\Facebook-Login-Test-3.jmx". 2. Right-click on the "GET SSL Home Page" HTTP Request sampler, and select "Add > Post Processors > Regular Expression Extractor". You see the "Regular Expression Extractor" settings screen. Regular Expression: a href="([^"]*)" title="Log into Facebook"
4. Click "File > Save Test Plan As" menu and save it as "\fyicenter\Facebook-Login-Test-4.jmx". 5. Click "Run > Start" menu to run the test. 6. The login page URL should be stored in the variable "loginURL" now.